One of the important life skills we need to pass onto our kids is how to manage their emotions. That’s what we’re doing when we soothe our babies, when we intervene in sibling conflicts, when we send our kids to their rooms and when we show interest in their stories or laugh at their jokes. Parents sometime struggle with what to do with kids or teens who are prone to worry or who have intensely angry outbursts or those who are withdrawn and non-communicative. Here’s a framework that can help with all of these. Give your child or teen an opportunity to offload the story and the feelings. Give them your focused attention, put away your device. It’s ok if you’re doing something else while they talk. That side by side style of conversation can be really helpful to boys or reluctant talkers. Sound interested, ask what happened next. Ask “ is there’s anything else?” Reassure them you can understand how they would feel the way they do (even if you think it’s an overreaction – it’s real to them). If you need to draw out their feelings – “sounds like you’re really disappointed?” They’ll let you know whether you’re right or wrong. Most kids will appreciate your attempt to genuinely understand. There’s a cautionary note here – avoid getting sucked into the emotional vortex with them. Picture yourself as the wise lifeguard on the shore ready to throw them the life ring not floundering in the water with them! If it seems they’re ok to move on then get them to brainstorm possible solutions/options. See how many they can come up with. Throw in funny ideas and practical ones. If you can have a laugh in the process it helps defuse the emotion. Get them to pick the idea they like the best and choose a time to try it out. Ask them to let you know how it goes. Follow up if they forget to fill you in. It gives you an opportunity to acknowledge their good ideas, their ability to think creatively and to take action in challenging situations. This builds kids and teens sense of themselves as capable problem solvers. When other challenges come up in future you can refer them back to this one to remind them of their capabilities and your belief in them. There are times when emotional outbursts happen and there is no opportunity to work through this framework just then. It’s appropriate to say “I can see you’re upset and we need to get out the door so let’s book a time after school to work it out. Can you remind me?” You may need to be very firm about this. You may also need to set up a consequence eg “if you make us late you’ll need to repay some time after school.” Restate that you’re happy to work it out after school. Give them what space you can to comply and then keep moving. 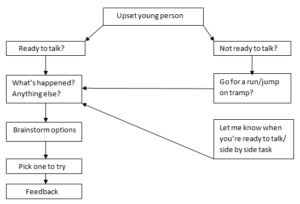 If you have a young person who is reluctant to talk so you can’t use the framework fully then take a punt at what they’re feeling. “You seem down this week. Let me know if I can help with something.” See if they’ll go out somewhere with you so you can talk in the car. Others will open up if we sit on the end of the bed either in silence or talking about our day until they’re ready to talk about theirs. Use your instincts about what will work with your child or teen. Whatever the challenge you’re facing let your young person know that is your job to help them learn the skills they will need for a successful and enjoyable life and that you’ll work it out together.